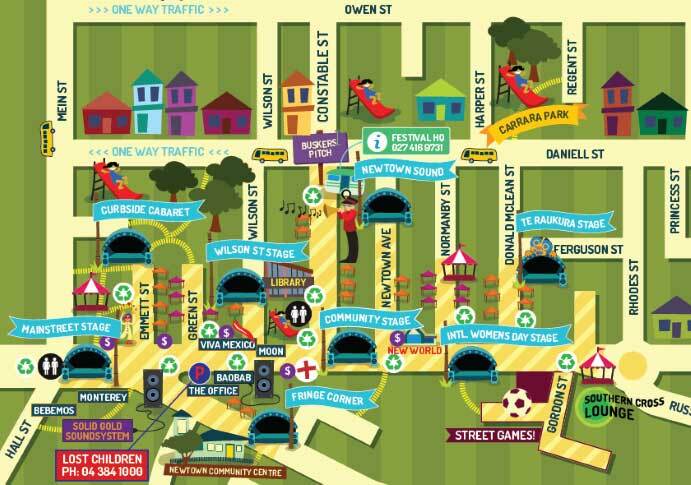 Welcome to the most amazing bizarre, stage at the Newtown festival! 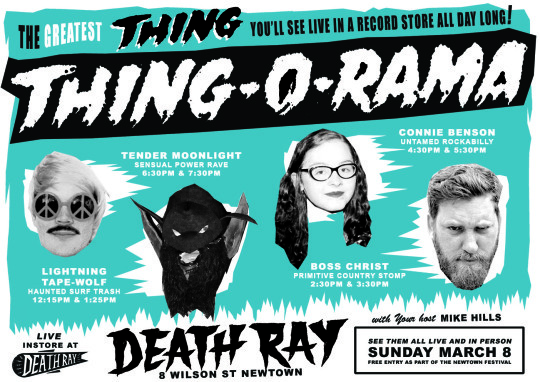 “THING-O-RAMA”, a primitive rock n roll showcase at Newtown’s AMAZING!!! music store, Death Ray Records. Featuring one man? band teen sensations, half tape, half wolf and half human, the esoteric surf monster “Lightning TAPE WOLF“! One man monster-billy extravaganza, part rockabilly and rural trash “BOSS CHRIST”! Nice on the outside but all wild twanging surf inside “CONNIE BENSON”! And the super fantastic entertainer that is “TENDER MOONLIGHT”! The Death Ray one person stage is sure to entertain. From outta space we have Lightning Tape Wolf. He is the reincarnation of Tape Man and part of the Tapemen. A combination of lightning fast twangin surf riffs and trashy rock n roll guitars, Part Wolf part Tape and somewhat human allows him to use all his inner spirits to conjure up a spectacular spectacle never before seen to the common eye. The Pahiatua representative, Boss Christ is a one man wreaking rockabilly roadhouse. Boss’s ratios are 50% country 100% trash. Famous in Palmerston North for his complete mess up of a country song on a tractor, the result was “Monsterbilly,” raw uncut rockabilly. Don’t be fooled by Connie Benson’s innocent looks, this lass has bad in her. When on stage her fingers do the talking. It’s been said part of Link Wray entered Connie when he died to give her the finishing touches of a surf twanging rock n roll guitarist great. Tender Moonlight is our last solo act. Probably our wildest of the day. Tender claims to travel back to the future to keep ahead of coming fads. Dressed only with freedom and small leggings, the Moonlight act will cause you to bump & grind to his 80’s industrial new wave peace music made directly from his super robot beats pad.